Observations on : The British Society for Effecting the Abolition of the Slave Trade was founded in 1787 by a group (predominantly Quaker) of committed anti-slavery advocates who attempted to change public opinion about the morality of slavery and to persuade Parliament to enact its abolition throughout the empire. Early members inlcuded William Wilberforce (a member of parliament), Thomas Clarkson (a gifted orator and writer), and Josiah Wedgwood (a successful pottery industrialist). A key to their success was a clever marketing campaign to arouse public opinion in favour of abolition. Using designs created by Wedgwood, the committee disseminated medallions, cameo jewelry, seals, coins, and pamphlets showing the classic image of the kneeling African slave, with chains on his hands and legs, asking the very pertinent question which cut to the heart of the immorality of slavery: "Am I not a man and a brother?" After 20 years of campaigning the British parliament eventually passed legislation ending the slave trade in 1807. The committee then redirected its efforts to abolishing slavery itself in the colonies, which was achieved in 1833.Wedgwood's iconic image was also used in various adaptations in France and the United States in the 1830s as the aboitionist movement developed in the decades leading up to the Civil War. Versions appeared which also showed female slaves asking if they were not sisters of the free Europeans. Observations on : Another famous image from the British anti-slavery movement is this broadside published in London in 1789. It was published in their thousands in various forms in Plymouth, Philadelphia, and London as booklets and broadsides and helped spread information about the condition of slaves in the transport ships that brought them from Africa to the Americas. It is a clever use of cold, technical data about a specific slave ship called the "Brooks" (note the great detail about the size of the decks and the space available for packing the slaves in tightly) with a minimal use of emotive language. The data was taken from a Parliamentary inquiry into the slave ships using British ports. One has to look closely at the images above the text to discover that the densely packed cargo is not bales of produce but human beings chained together. After four densely printed columns of text it is only in the last two paragraphs that a condemnation of the slave trade is made, the last paragraph reading: "As then the inhumanity of this trade must be universally admitted and lamented, people would do well to consider, that it does not often fall to the lot of individuals, to have an opporunity of performing so important a moral and religious duty, as that of endeavouring to put an end to a practice, which may, without exaggeration, be stiled one of the greatest evils at this day existing upon the earth." These images of the Brooks and its cargo were taken up by other abolitionist groups in the 19th century, including the American and French. It also appeared in books like Clarkson's History of the Abolition of the African Slave Trade (1808). A full transcription of the text is provided below. [See a larger version of the image 1.8 MB JPG]. DESCRIPTION OF A SLAVE SHIP. The PLAN and SECTIONS annexed exhibit a slave ship with the slaves stowed. (*) In order to give a representation of the trade against which no complaint of exaggeration could be brought by those concerned in it, the Brooks is here described, a ship well known in the trade, and the first mentioned in the report delivered to the House of Commons last year by Captain Parrey, who was sent to Liverpool by Government to take the dimensions of the ships employed in the African slave trade from that port. The plans and sections are on a scale of the 8th of an inch to a foot. To the Men 6 feet by 1 foot 4 inches. Women 5 feet 10 in. by 1 foot 4 in. Boys 5 feet by 1 foot 2 in. Girls 4 feet 6 in. by 1 foot. (*) This is the usual manner of placing the slaves, butx it varies according to the position of the ship, and the practice of different commanders. The principal difference is in the men. It must be observed that the men, from whom only insurrections are to be feared, are kept continually in irons, and must be stowed in the room allotted for them, which is of a more secure construction than the rest. As the ship on this plan would stow 42 women boys and girls in the places here allotted them more than she did carry, supporting that number taken from the mens room and placed in their stead, this will reduce the number of men to 309 in the mens room; of course the room allowed them, instead of being 16 inches as in the plan was in reality only 10 inches each; but if the whole number 351 were stowed in the mens room, they had only 9 inches each to lay in. The men therefore, instead of lying on their backs, were placed, as is usual, in full ships, on their sides, or on each other. In which last situation they are not unfrequently found dead in the morning. The longitudinal section, fig. 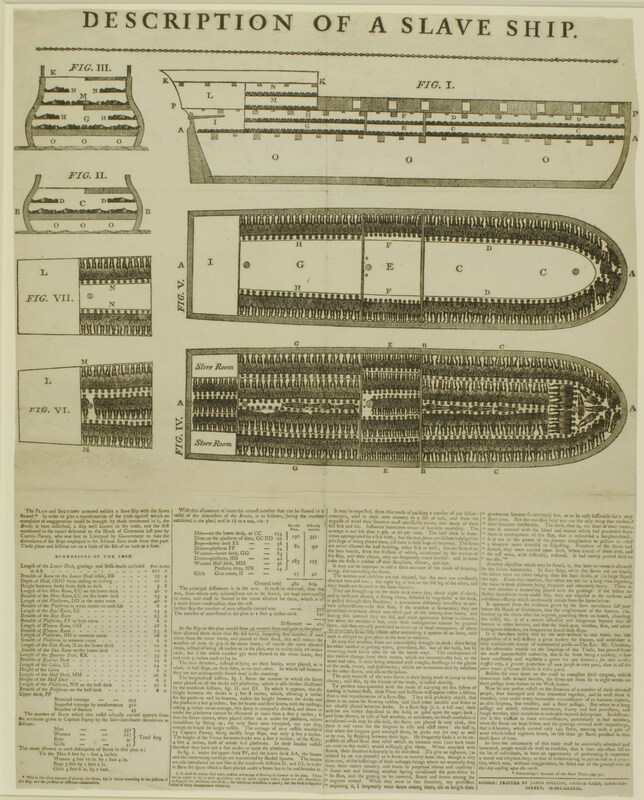 I shows the manner in which the slaves were placed on all the decks and platforms, which is also further illustrated by the transverse sections, fig. II. and III. By which it appears, that the height between the decks is 5 feet 8 inches, which allowing 2 inches for the platform and its bearers, makes the height between the decks and the platform 2 feet 9 inches; but the beams and their knees, with the carlings, taking 4 inches on an average, this space is unequally divided, and above or under the platforms cannot be estimated at more than 2 feet 7 inches; so that the slaves cannot, when placed either on or under the platform, relieve themselves by sitting up; the very short ones excepted, nor can they except on board the larger vessels. The average of nine vessels measured by Captain Parrey, being mostly large ships, was only 5 feet 2 inches. The height of the Venus between decks was 4 feet 2 inches; of the Kitty, 4 feet 4 inches, both of which had platforms. In these smaller vessels therefore they have not 2 feet under or upon the platforms. In fig. I, under the upper deck PP, and the lower deck AA, the beams and the intervening carlings are represented by shaded sqares. The beams are also introduced on one side of the transverse sections II. and III, in order to shew the space which a slave placed under a beam has to lie and breathe in. (+) It must be notd, that every possible advantage of stowing is allowed in the plan. There are or ought to be in each apartment one of more poopoo tubs; there are also stanchions to support the platforms and decks; for which no deduction is made; but the deck is supported clear of every encumbrance whatever. It may be expected, from this mode of packing a number of our fellow-creatures, used in their own country to a life of ease, and from the anguish of mind their situation must necessarily create, that many of them fall sick and die. Instances sometimes occur of horrible mortality. The average is not less than 1-5th, or 20 percent. The half deck is sometimes appropriated for a sick birth, but the men slaves are seldom indulged the privilege of being placed there, till there is little hope of recovery. The slaves are never allowed the least bedding, either sick or well; but are stowed on the bare boards, from the friction of which, occasioned by the motion of the ship, and their chains, are frequently much bruised; and in some cases the flesh is rubbed off their shoulders, elbows, and hips. It may not be improper to add a short account of the mode of securing, airing, and exercising the slaves. The women and children are not chained, but the men are constantly chained two and two; the right leg of one to the left leg of the other, and their hands are secured in the same manner. They are brought up on the main deck every day, about eight o'clock, and as each pair ascend, a strong chain, fastened by ring-bolts to the deck, is passed through their shackles; a precaution absolutely necessary to prevent insurrections. -In this state, if the weather is favourable, they are permitted to remain about one-third part of the twenty-four hours, and during this interval they are fed, and their apartment below is cleaned; but when the weather is bad, even those indulgencies cannot be granted them, and they are only permitted to come up in small companies, of about ten at a time, to be fed, where after remaining a quarter of an hour, each mess is obliged to give place to the next in rotation. In very bad weather, some are unavoidably brought on deck; there being no other method of getting water, provisions etc. out of the hold, but by removing those slaves who lie on the hatch-ways. The consequence of this violent change from their rooms, which are inconceivably hot, to the wind and rain, is their being attacked with coughs, swellings of the glands of the neck, fevers, and dysenteries; which are communicated by infection to the other slaves, and also to the sailors. The only exercise of the men-slaves is their being made to jump in their chains; and this by the friends of the trade, is called dancing. Another objection which may be stated, is, that here no room is allowed for the sailors hammocks. In slave ships, while the slaves are on board, the sailors have no other lodging than the bare decks, or (in large ships) the tops. From this exposure, they often are wet for a long time together, the rains in those climates being frequent and extremely heavy. There is in wet weather a tarpawling placed over the gratings; if the sailors to shelter themselves creep under this, they are exposed to the noisome and infectious effluvia which continually exhale from the slaves below. It appeared from the evidence given by the slave merchants last year before the House of Commons, that the employment of the seamen, viz. boating up the rivers after the negroes, guarding them on board, cleansing the vessel, etc. is of a nature offensive and dangerous beyond that of seamen in other services, and that the small-pox, measles, flux, and other contagious disorders, are frequent on board these ships. It is therefore falsely said by the well-wishers to this trade, that the suppression of it will destroy a great nursery for seamen, and annihilate a very considerable source of commercial profit. -The Rev. Mr. Clarkson, in his admirable treatise on the Impolicy of the Trade, has proved from the most incontestable authority, that so far from being a nursery, it has been constantly and regularly a grave for our seamen; for that in this traffic only, a greater proportion of men perish in ONE year, than in all the other trades of Great Britain in TWO years. Besides the time spent on the coast to complete their cargoes, which sometimes lasts several months, the slaves are from six to eight week on their passage from thence to the West-Indies. Now let any person reflect on the situation of a number of those devoted people, thus managed and thus crammed together, and he must think it dreadful, even under every favourable circumstance of an humane captain, an able surgeon, fine weather, and a short passage. But when to a long passage are added, inhuman treatment, scanty and bad provisons, and rough weather, their condition is miserable beyond description. So destructive is this traffic in some circumstances, particularly in bad weather, when the slaves are kept below, and the gratings covered with tarpawlings, that a schooner, which carried only 140 slaves, meeting with a gale of wind which lasted eighteen hours, no less than 50 slaves perished in that small space of time. As then the inhumanity of this trade must be universally admitted and lamented, people would do well to consider, that it does not often fall to the lot of individuals, to have an opporunity of performing so important a moral and religious duty, as that of endeavouring to put an end to a practice, which may, without exaggeration, be stiled one of the greatest evils at this day existing upon the earth. (*) Falconbridge's Account of the Slave Trade, page 31. LONDON: PRINTED BY JAMES PHILLIPS, GEORGE-YARD, LOMBARD STREET. MDCCLXXXIX .